CBPP. This map dates from May 2018; since that time, Maine’s expansion is now considered in effect. To date, 33 states and the District of Columbia have elected to expand their Medicaid systems to provide greater health insurance coverage. But in the remaining 17 states, approximately 2.2 million lack the healthcare coverage they would have otherwise received. These people fall into the category of “working poor,” earning too much to qualify for traditional Medicaid but too little to be able to afford health insurance on their own. According to a recent report from the Center for American Progress, extending coverage to all of these 2.2 million would save over 14,000 lives a year. In Idaho, the Medicaid expansion passed by an especially large margin, with 61 percent in favor and 39 percent against. The Nebraska expansion passed with a tighter margin: 53 percent of voters in favor, and 47 percent against. And in Utah…the vote still hasn’t been certified by the state, but…the proposition leads with 54 percent of the vote. These votes raise the number of states with expanded Medicaid to 36. But other states may join them. 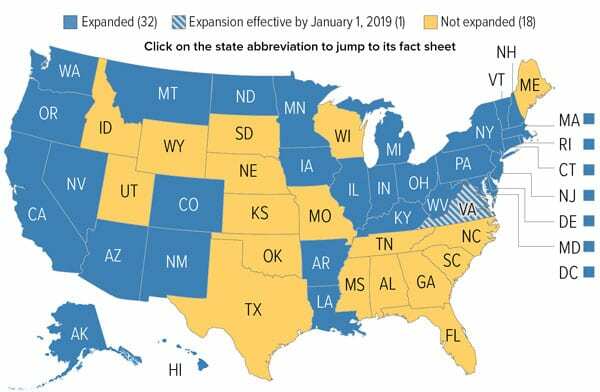 In Kansas, and Wisconsin, Republican governors had blocked Medicaid expansion, but with new Democratic governors now elected in those states, the number with expanded Medicaid may rise to 38. On the other hand, in Montana, an initiative to raise tobacco taxes by $2 a pack to make Medicaid expansion permanent (Initiative 185) was defeated by a 53 percent to 47 percent margin. As many as 100,000 may lose coverage in that state. Jessica Rachels, 37, from Sandpoint, is a full-time caregiver to her daughter, who has a disability. Rachels was just diagnosed in June with bipolar disorder and has already spent hundreds of dollars on treatment. She said she hasn’t had health insurance in 12 years; her family has had to decide between paying their bills and keeping a roof over their head, or getting her health care. Rachels and an estimated 119,000 other Idaho residents will now gain Medicaid coverage.